Vampires have, in fiction and folklore, terrified, exhilarated, astounded, amused and entertained people since the beginning of the human race. Just about every culture on earth has vampire folklore handed down from generation to generation. In 1047, the first appearance of the written word for vampire, "upir", appears in a document referring to a Russian prince. Imagine, that was almost a thousand years ago. Now we have everything from Lord Ruthwen to Lestat. What a long way we've come. 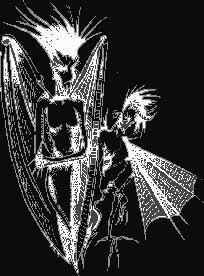 Vampire Junction was started in 1991 as a non-profit zine devoted to the promotion of the vampire in fiction, fact and art. This web page's contents were gleaned from five years worth of zines, plus a few extras thrown in for good measure. Please, make yourself comfortable. Browse around. If you have any questions on how to submit, or suggestions, please feel free to contact me at the address at the bottom of this page. These pages are viewed best with Netscape 3.0 and higher. Links will not change color when using Microsoft IE, sorry. I apologize for my laxness in updating the zine. I am currently working on a new and improved version, and will have it up within the next few months. Thanks for your patience. Submissions: Now would be a good time to send in submissions. Send stories etc... in text format. Pics in any format. Book & movie reviews are especially needed since I really don't enjoy doing them much. Any submissions received in the last year or so will be included in the updated version. And now I would like to thank the over 100,000- people who have visited the site in the last 6 years. And I would like to specially thank all the people who have e-mail me about Vampire Junction. You have no idea how much it means to me that so many people have enjoyed and appreciated all my work AND that you took the time to tell me. Again, a big thank you!! This is what it's all about. Literature - Zines, Authors, Books, Screenplays, etc..
All of the writings contained on these pages are the property of the respective authors, and as such should not be reproduced, except for personal consumption, without the express written consent of said authors. To do so will be considered copyright violation. "S.P. Somtow, author of the book Vampire Junction, has granted permission for his title to be used as the name of this magazine, but he is not affiliated with the magazine or it's editorial contents."